Peckham is a long way from Andalusia. But when Flamenco Express perform at the Bussey Building it’s like a passionate and piquant portion of southern Spain is miraculously delivered to south London. This Greenwich-based company is made up of dancer La Joaquina and guitarist Chris Clavo, both scintillating performers in their own right who are joined by a guest dancer and musician for each show. Anna Winter – March 2017 Exeuntmagazine.com – Read full review.. This small company, comprised of four dancers and four musicians, created a dynamic performance last Thursday night at the LABAN Theatre. The female dancers began the evening with a vibrant group piece, followed by a series of solo performances. Their steps provided a rhythm for the music created by the sweet sounds of the guitarists and the rough vocals of the singers. Through the performance the music built in speed and intensity seducing the listener while the dancers captivated with their powerful grace. Delighted the audience, who rewarded them with rapturous applause and encores. This feisty flamenco company deliver the finest in flamenco, plus sizzling soloist La Joaquina. Utterly riveting variations of firecracker beats…tumultuous fervour ..indelible gracefulness. 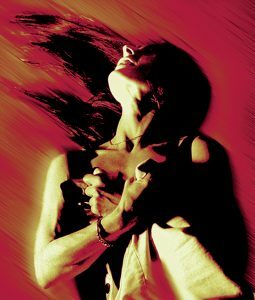 This is a fiery ensemble production where every spark of personality is kept alight and creative diversity is given the space to breathe but remain faithful to flamenco’s roots. ..what was surprising, however, was the sheer power and energy displayed by the dancers during this vibrant celebration of Spanish culture. Forget the sterile, regimented flamenco so often served up to tourists: this was the real thing, and to say that it packed a punch is an understatement. Flamenco Express transported the audience to an imaginary Spanish haven during a musical journey laced with passion, grace and immense artistry. The cold, grey and windy weather outside seemed a million miles away.